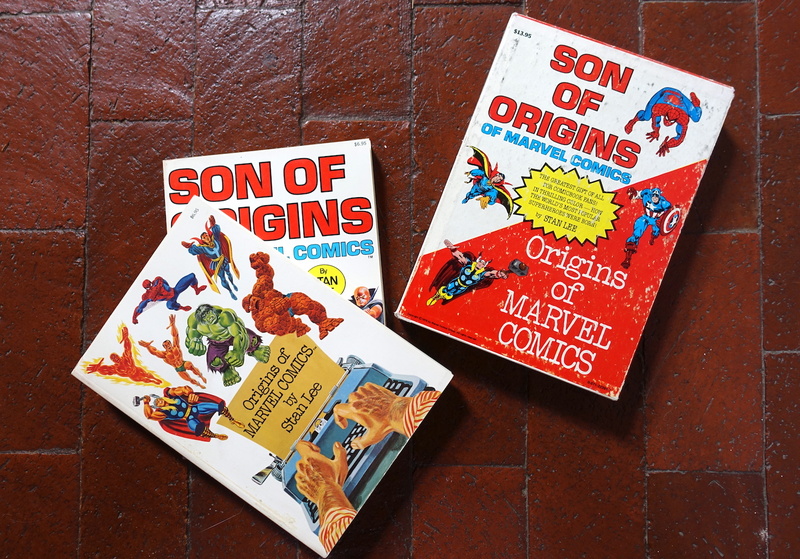 Without Steve Ditko, this Marvel-origins collection would have been a good deal slimmer. As a polyglot lot of colorfully clad heroes comes to blows in France, displaying superhuman powers acquired from Stan Lee only knows where, we bid farewell to the co-creator of many another costumed combatant, comic-book artist Steve Ditko. With Lee and Jack Kirby Ditko had a hand in the debut of, among others, The Amazing Spider-Man and Doctor Strange. The young Ditko dug Will “The Spirit” Eisner, and you can see a bit of Eisner’s noirish style in his work; this admiration clearly filtered down to some of the undergrounds, like Rand “Harold Hedd” Holmes and Dave “Dealer McDope” Sheridan. 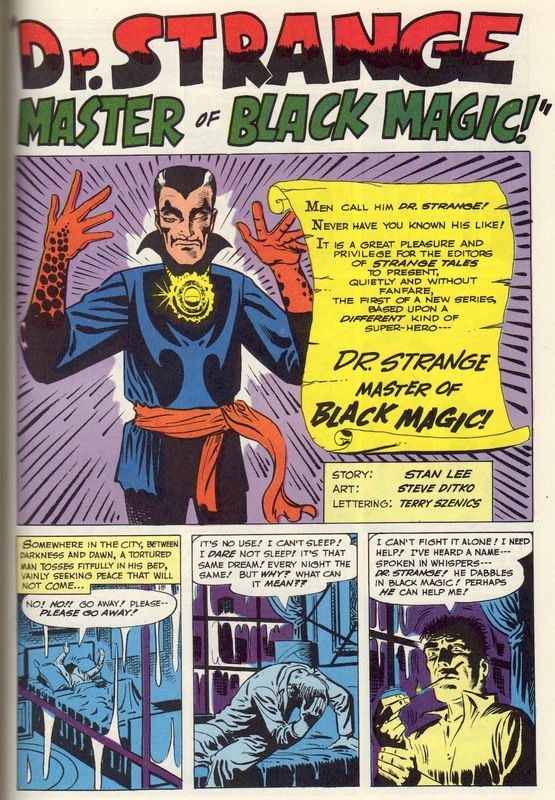 Doctor Strange as imagined by Steve Ditko. Unlike Lee, who had (and maintains) a flair for showmanship, Ditko apparently was a recluse who declined interviews, snubbed comic-book conventions, and spurned invitations to movie premieres. According to Lee, in “Origins of Marvel Comics,” Ditko got the job of drawing Spidey after Kirby’s take on the character proved “too good” to depict the tormented teenage geek Lee had in mind. “All those years of drawing superheroes must have made it a little difficult to labor so mightily and come forth with a superloser, or if you will, a supershnook,” Lee wrote. Ditko died alone in his Manhattan home, age 90. This entry was posted on July 7, 2018 at 8:19 am and is filed under Absent friends, Arts & letters, Cartooning. You can follow any responses to this entry through the RSS 2.0 feed. You can leave a response, or trackback from your own site. I was a freak for Marvel comics when I was a kid. Our little crossroads had two general stores and one of them had a small magazine rack containing Life, Look, Popular Mechanics, Modern Romance, and DC and Marvel comics. I cut my teeth on DC (Superman), but soon graduated to Marvel. Dr. Strange was my favorite. Sad to hear that Ditko has left the planet. I started out with DC, then shifted to Marvel, and then read whatever Neal Adams was illustrating, which could be anything from Batman to Green Lantern-Green Arrow to the Avengers to the X-Men. I really enjoyed his Batman. He and Dennis O’Neill darkened the Dark Knight up quite a bit, though not as much as Frank Miller would later on. Mr. Ditko has returned to the source. I have not watched the Dr. Strange movie yet. Maybe I should watch it today. It’s pretty forgettable, Pat. Frumious Bandersnatch is good as the Doc, but Robert Downey Jr. would’ve been better, had he not been drafted as Iron Man a jillion movies ago. I’d have settled for Billy Bob Thornton, too. We watched it today, and you are right. The Dr. Strange character screamed for Downey, but overall the script seemed pretty weak to me. We did pick up on the Escher’s Perpetual Staircase art being an inspiration for some of the CGI. And the obvious hints to the sequels that occurs in all recent Marvel movies is staring to turn me off. The gods have become boring. And yeah, the teasers are likewise, along with the Stan Lee cameos. Zack Snyder should be exiled to the Phantom Zone. How on Earth (or Krypton) does he keep acquiring vast quantities of other people’s money to flush down the loo? Next thing you know he’ll be president.